Celtic roots go back in time in Malta; for starters, there’s the memories and memorabilia of various arms of the British services and merchant navy folk (think of those artefacts in the War and Maritime Museums) and there’s a good deal of Celtic legacy in some of our local family names, not to mention names of pubs, clubs and bars around the islands. St Andrew’s Scots Church in South Street, Valletta, celebrated 150 years in 2007, and is the venue this St Patrick’s Day, 17 March, of a very special, lively musical evening; Keltika Choir performing its popular, annual Celtic Roots concert. Michelle Paris, its musical director, explains how the choir came to be, and why Celtic music – both traditional and contemporary pop – has captured the imagination of a whole group of young people, most of whom have no familial Celtic roots! Ticket Give-Away! UPDATE – ALL COMP TICKETS GONE NOW. Keltika has very kindly donated some tickets for its 17 March concert to Malta Inside Out followers. If you’d like a chance to win a ticket, please leave a comment below by midnight Friday, 15 March. One ticket per entrant. We’ll pick winners at random and notify you by emailasap. Winners’ tickets will be available for collection at the door on the concert night. Keltika, a choir exploring Celtic musical genres, from popular to traditional, in Malta? This has to spark a question about how you came into being. Those who have known me for years know that my love for Irish and Celtic Music, as well as the country, the history, its people and its culture dates back quite a while. As a teenager, it was always my dream to belong to an Irish music band but my attempts at the time were short-lived. In 2008, I was given the opportunity to spear head a Musical Education Project when I was employed at University of Malta. We discussed the lack of platforms and performance opportunities for non-trained, often self-taught musicians and singers to ‘take the leap’ in a less-formal environment. We all felt strongly about it and decided to take action. We decided to organise a concert on a shoe-string budget with proceeds going to charity. The next step was to decide on what repertoire we were going to perform. Through discussing with the students who, in the majority, belonged to my generation, it emerged that most of us were familiar with Irish music (at the time more Pop or Celtic Rock). We ended a first year educational programme with a sell-out concert in an overcrowded chapel at University of Malta. The sheer enthusiasm of the seventy-strong performers, many of whom had never performed in front of a full house, was palpable. The experience left us buzzing and we decided to establish a group to carry forward this vision and keep this platform of performance opportunities and knowledge sharing alive, enabling us to nurture and uncover hidden musical talent among young people who perhaps, for one reason or another, did not have access to such opportunities before. And after that, we never looked back – Keltika was born. Keltika, we hear, is a rather unusual choir as it has a fluid membership that seems to determine the musical route it takes year on year. The common element is everyone’s love of music. Members of Keltika are very diverse but all have the enthusiasm to get out on stage and perform. That is where our energy is generated. We inspire one another and it shows when the concert comes together. Some of our members are classically trained and can read and play music while others, generally the majority, are self taught and can not read music and still deliver with passion. The repertoire chosen is usually arranged (and tailored) by me in such way to suit difference levels of musical competency and skills. The coaching and mentoring is both theoretical as well as auditory. Of course we all benefit from giving to each other. If I spend time and money doing master classes or working abroad with choirs such as Anuna, I bring back something added to the benefit of Keltika. Equally, each year’s selected ‘auditionees’ bring an added dynamic. Do you have a feel for your audience’s make up? We cater for a diverse audience of locals, expats and tourists; the latter two groups by no means only of Celtic origin. We select pieces which are well known internationally, as well as pieces which are synonymous with Irish nationals or people with Irish heritage. In the early concerts, we presented pieces by Enya and The Corrs; subsequently we included songs by The Dubliners, The Chieftains, The Pogues and The Clancy Brothers. Recently due to my strong connection with Anuna in Ireland, we included some of Michael McGlynn’s finest choral work as well as popular pieces from Riverdance. Our focus is not just on Irish music but also includes music from countries with a Celtic heritage or legacy, including Scotland, Wales, Brittany and the Netherlands to mention a few. Over the years, we have got a feeling of what works and we always keep that in mind when choosing the repertoire. In fact, this year, since we are celebrating our 5th anniversary, we discussed pieces which worked the best over these five years and decided to include them in the programme, both as a tribute to our past successes and also because we just love playing/singing them! Our audiences have also learned what to expect from our concerts and sometimes we have to do very little to persuade them to come along – it is an enjoyable evening for all and everyone is invited. How do you promote the choir? We keep in regular touch with our followers through our Facebook Page and post behind the scenes videos on our YouTube channel as we also like to show aspects of our creative process. It also helps set the scene (and expectations) for any upcoming concerts. Our concerts do not take place in setting that classical music concert-goers are accustomed to. The atmosphere is more relaxed and our audience is always encouraged to join in, clap, sing and even dance. It is a celebration of music and culture in its most engaging form! We are also rather adventurous in bringing different art forms together, by extending our repertoire to include some celtic fusion songs and setting ballet to a different tune. We had introduced ballet in our first concert and this year we are revisiting the idea thanks to Francesca Cassar – the rest is a surprise! The choir has a deep-rooted community spirit. What entity is Keltika supporting with proceeds of its March 17 concert and why? All members of Keltika are volunteers and offer their talents, services and commitment without payment. Last year, we heard about Puttinu Cares and their project to build a block of flats in the UK for Maltese families who need accommodation while their loved ones receive treatment which is not available in Malta. We know that there are many other projects and organisations that do not always necessarily fall within mainstream funding support and each year we try to support a different cause. This year, through my work with St Andrew’s Scots Church, we found out that the church is refurbishing the Crypt to transform it into a Drop-In Centre to help the poorest in Malta. Therefore the proceeds from the upcoming concert will be supporting this cause. What of Keltika in the future? Overseas concerts, competitions, or simply a choir that loves the challenges found in its home market? My vision for Keltika grows each year – there is so much I would like to do with the group but all this depends on funding, which is always the biggest hurdle. The second hurdle is the availability of the performers and resources available. One of my biggest dreams is to be able to reward the Keltika performers by offering them the opportunity to attend master classes in Irish and Celtic Music in Ireland. We are currently looking for support for this project, so if anyone is able to help us out, please get in touch! 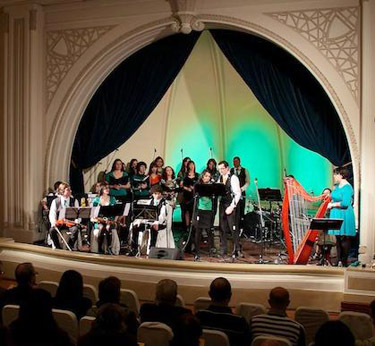 Keltika’s annual St. Patrick’s Day Concert will be held at the St Andrew’s Scots Church, South Street, Valletta. Celtic Roots, our special Anniversary Concert will feature all time favourites such as ‘The Town I Loved So Well’, ‘Whiskey in a Jar’ and ‘Wild Rover’, as well as other songs from previous concerts such as ‘Orinoco Flow’ by Enya. It will be an evening jam packed with memories, milestones, great music and good cheer! Keltika will be performing live under the Musical Direction of Michelle K. Paris. The concert starts at 7.30pm with doors open at 6.45pm. The musical evening will be full of memorable moments, milestones, Irish and Celtic music old and new. Tickets cost €10.00 (free seating event) and can be booked in advance by emailing us on keltikamusic@gmail.com. Tickets available at the door subject to availability. The proceeds of this event will go to St Andrew’s Scots Church project for a drop-in centre. Well I’m 100% pure Irish blood and living in Malta. It would be a céad míle fáilte ( a thousand welcomes to receive a ticket for free) Thanking you in anticipation! Hi, this is Annabel. May I have a free ticket for Keltika please. I’m part Welsh; part Scottish and my friend Jean is 100% Scottish, so we feel that we;’re wholly Celtic and would love to celebrate St Patrick’s Day with Irish friends.